It's All That! Jeep Unveils 90s-Looking Wrangler. Talk To The Hand! Hey there, tubular teens! Jeep knows the 1990s are back, so they’re bringing us this COOL purple-and-pink Jeep Wrangler! Whoomp, there it is! Technically this hella fly ride is called the “2016 Jeep Wrangler Backcountry,” but from here on out it’s going to be known as the 90s Wrangler, aiight. 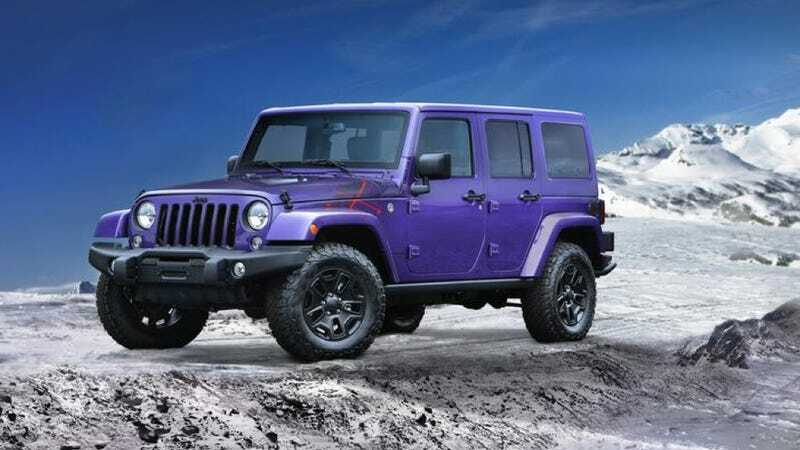 It’s not really much more than a cosmetics package, and Jeep says that it’ll be available in colors ranging from blue to black to white to gray, but really all I’m interested in is this dope hue called Xtreme Purple. And you know it’s XXXTREME because it says it right in the name. I mean, would you get this Jeep in anything other than Xtreme Purple? As if! Just check out those graphics up close, and dream of the days when you could still buy a Geo Tracker. And if you’re too young to remember the Geo Tracker, all you need to know is that that car was da bomb.